إن فندق Alatai Holiday Apartments بموقعه الممتاز في دارون سيتي هو نقطة انطلاق جيدة لنزهاتك في داروين. يقع مركز المدينة على بعد 1 km فقط. ويمكن الوصول إلى المطار خلال 15 دقيقة. يوفر الفندق بفضل موقعة الجيد وصولاً سهلاً إلى أهم معالم المدينة.
. كما يقدم Alatai Holiday Apartments الكثير من الخدمات لإغناء رحلتك في داروين. يقدم الفندق فرصة للاستمتاع بشريحة واسعة من الخدمات بما فيها: واي فاي مجاني في جميع الغرف, مرافق مخصصة لذوي الاحتياجات الخاصة, صف السيارات, خدمة الغرف, غرفة عائلية . تتضمن كل غرف النزلاء وسائل الراحة والتسلية المصممة خصيصاً لضمان الراحة القصوى للضيوف. يقدم الفندق مجموعة واسعة من وسائل الراحة المتنوعة، كمثل: مسار جولف - ضمن 3 كم, حمام سباحة خارجي, حديقة. إن كنت تتطلع إلى إقامة مريحة وهادئة في داروين، فستجد في Alatai Holiday Apartments بيتك الثاني. يطلب العقار مبلغًا تأمينيًا قابلاً للاسترداد بقيمة تتراوح بين 100 إلى 300 درهم إماراتي عند تسجيل الوصول. العطلات الرسمية: من الساعة 08:00 صباحًا إلى الساعة 11:00 صباحًا. 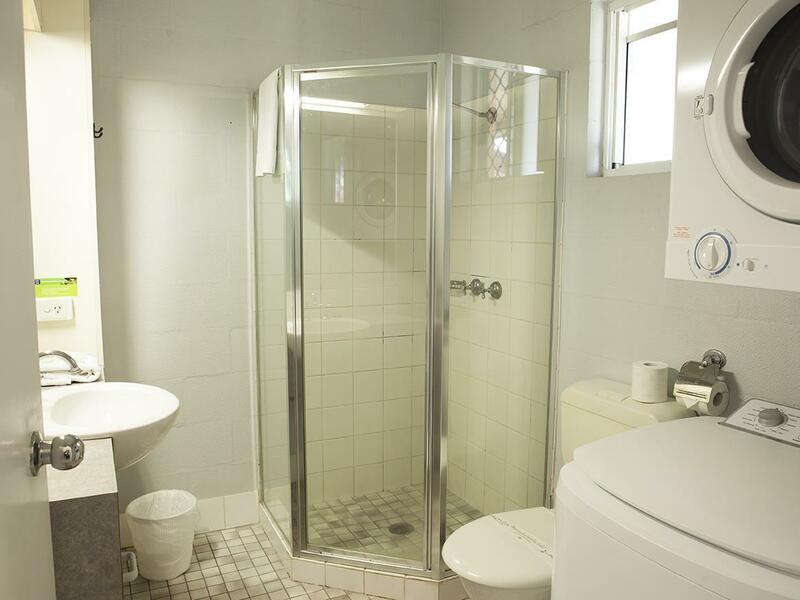 Indeed a great location to stay as it is close to Darwin’s CBD. Rooms are pretty decent in size but cleanliness is not that impressive but not too bad anyway. Staff were accommodating and nice. Will surely recommend and be back to stay whenever we are in Darwin. Management let us check in early as we arrived in Darwin at 5:00 am from Singapore. We booked a self contained unit so I could cook a steak. Do our washing and drying in the machines provided in the unit. Or we could walk across the road to the pub where we could have a beer and a meal. Just a little way out of the city but that did not worry us because we had a vehicle. Studio with sofa microwave that can cook Clean comfort bed, hanger to dry clothes,smoke at balcony. Washing machine,dryer in toilet. It has everything there n quiet, peaceful location compare to Mitchell st noisy n kind of smell. Bldg look old from outside but is great inside will be back if I in Darwin again. We love this hotel so much because we felt just like being home. It has a kitchen with all the equipment that we need. The fool is pretty nice on a hot summer day. Staff were really friendly and we were even lucky enough to be sent to the airport by the owner in his Benz car. Great thanks~! Pros: Well located, clean with laundry facilities. Cons: Our booking states free light breakfast but the male receptionist initially refused to provide the breakfast citing that it is not stated in the booking. After some arguments only he grudgingly provided the breakfast, I mean it's just coffee n toast n we basically hv to enforce our rights! PROS: Large beds with excellent bedding. Decent bathrooms. Rooms had washing machines / dryers attached. Good, working air conditioners and excellent saltwater pool, which are a must in Darwin. Pleasant staff. CONS: Very basic breakfast (cereal, juice and toast) incurred an $8 charge, which was a little miserly. Room had constant smell of damp - some mould growing on ceiling (keeping in mind this was the middle of the wet season.) No information about public transport provided, and no availability of bicycles for hire - the assumption is that you will have a car. $100 room deposit required. the price is reasonable. there's a kitchenette and it's overall quite comfy. We were only there 1.5 days, and we had absolutely no complaints. Would recommend these apartments. I didn't rate the food side of the survey, because we didn't eat here. There needed to be an N/A option. The best things about this hotel are the staff, the price, and the in-room laundry facilities. 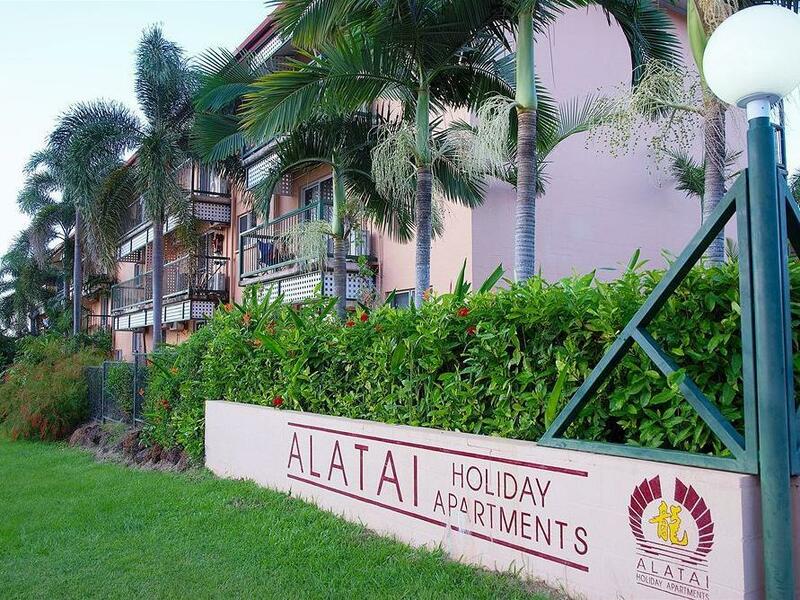 The Alatai Holiday Apartments are a cost-conscious traveler's dream. The rooms are somewhat worn, but perfectly serviceable, with in-room kitchenettes and washer/dryers. The free WiFi is only available in the reception area, but this just provides more opportunity to interact with the friendly and accommodating staff. The location is not in the middle of the tourist-oriented areas, but is within walking distance. Lovely stay, the room was big and so was the TV. Cooking, cleaning facilities were great. the staff were friendly. The surrounding area outside the rooms could do with some weeding and rubbish collection otherwise most enjoyable stay. Thai restuarant on site, size of room, large carpark. Reception on arrival was very poor - first thing we were told was that there would be a public holiday during our stay so our room would not be serviced on that date even though we paid the same price for each night. The grounds were dirty - cigarette butts everywhere. We were asked for a deposit "in case you trash the room". My friend in the next room was asked for a deposit. Reception staff need training! My stay with Alatai was good. I used it as somewhere to stay after a concert. It was affordable, clean, comfortable and it did the job. The guy at the front counter was nice, helpful and fast. He called me a taxi to take me to my car and was helpful. Not a fancy hotel by any means but if you need somewhere to stay it does the job. Can't fault it. I would stay here again if I needed somewhere to sleep for the night. We booked a 2 bedroom apartment as there were 3 of us. The apartment was spacious and rooms were big enough and all areas had fans and air conditioning. The apartment has a small kitchen with basic appliances including a fridge and microwave. The bathroom/laundry is not too small and having a washer and a dryer are handy even though we didn't use them due to our short stay. The staff were friendly and approachable. I didn't think they would have a swimming pool but they do which was great (unfortunately we didn't have time to use it)! I would highly recommend Alatai to family with kids and those with cars... however it is still walkable to Mitchell St (main restaurant street) - around 10 mins walk? If you're looking for a good value 3.5 star type accommodation, Alatai is fantastic! I cannot say anything wrong about the accomodation here except possibly no bathtub. That's not really a big deal even though our 20 month old daughter is not fond of showers as yet. Everything else was great and very modern and for a price well under $100 a night I could not complain. We had a two bedroom apartment with a door between the two. The room was big enough and the bathroom was also fine. A bit aged but who cares. It was clean and they changed the bedding and cleaned the room every day. It was a small apartment with a tv, safe and hair dryer. The staff were pleasant and there was a strip of cafes and restaurants right by. There was a theatre opposite the hotel.